Grab your pie plate and get baking because these recipes are scrumptious, simple and supreme crowd-pleasers. Not sure how to roll out a pie crust? Find out how easy it is here. Elvis was able to swivel his hips and make women bawl, but really, he was just your average Joe, a guy who loved peanut butter and banana sandwiches. 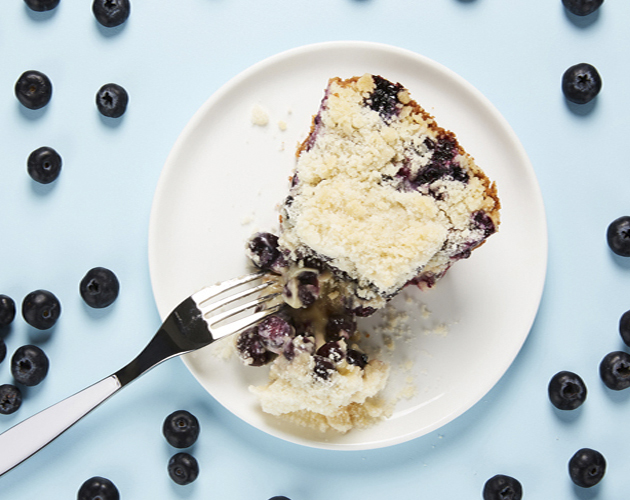 This pie is our hunka-hunka-freezing-love tribute to him – a simple, velvety smooth icebox pie that would surely have elicited a “thank you, thank you very much” from the Pelvis. 1) Preheat oven to 350°F. Coat a 9-inch pie plate with non-stick cooking spray. 2) For the crust, in a medium bowl, combine vanilla crumbs, butter and sugar. Press against the bottom and sides of the pie plate to form a crust. Bake for 10 minutes. Cool completely before filling. 3) Cover the bottom of the crust with the melted chocolate and arrange banana slices on top of chocolate. 4) In an electric mixer, cream together brown sugar, peanut butter, cream cheese and vanilla on medium speed until smooth. Gently fold in whipped topping and spread over bananas. Drizzle top with chocolate sundae syrup. 5) Cover pie with plastic wrap and place in freezer for at least 3 hours before serving. For easier cutting, remove from freezer 10 minutes before serving. Fats Domino isn’t the only one who found a little magic in a berry patch. Richie Cunningham, Little Richard and even Led Zeppelin also discovered ecstasy among the juicy purple orbs—and you can too. 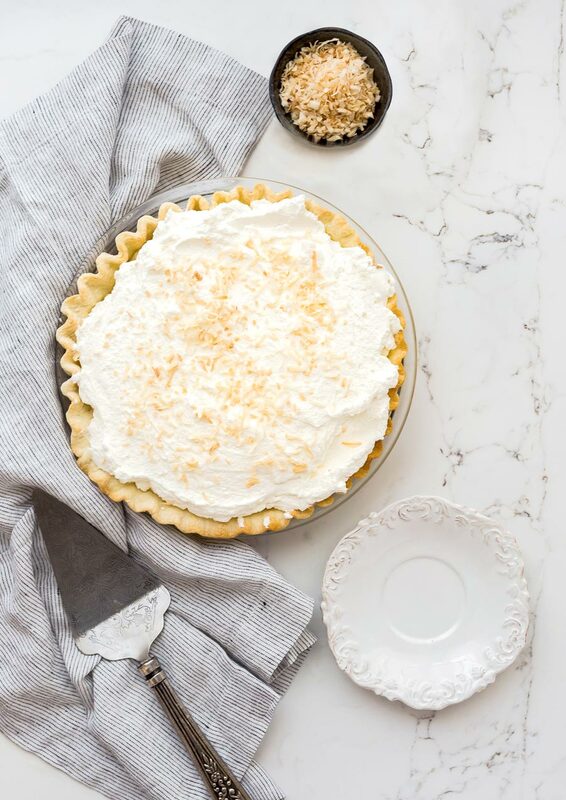 Hum along as you prepare this foolproof, sweet crisp-topped pie, so luscious it’ll make the moon stand still. 2) For the crust, in a medium bowl, combine graham crumbs, sugar and cinnamon. Add margarine and mix until well blended. Press the mixture onto the bottom and up the sides of the pie plate. Bake for 8 minutes and set aside to cool. 3) For the filling, in a large bowl, gently stir together blueberries, sugar, flour, lemon zest and salt. Gently fold in eggs, sour cream and vanilla. Spoon mixture into graham crust. 4) For the topping, in a small bowl, combine flour and sugar. Using a fork, mix in margarine until crumbly. Spread topping over the pie filling. 5) Bake 40-45 minutes until lightly browned on top. Cool for at least 1 hour before serving. 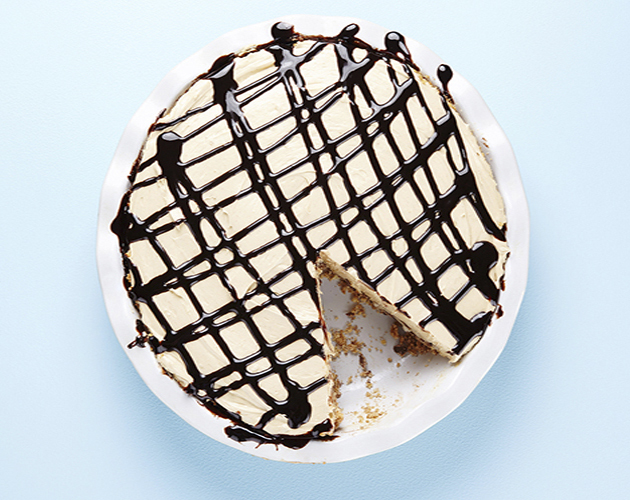 Chocolate lovers unite – this tasty recipe is going to make all your chocolate dreams come true. 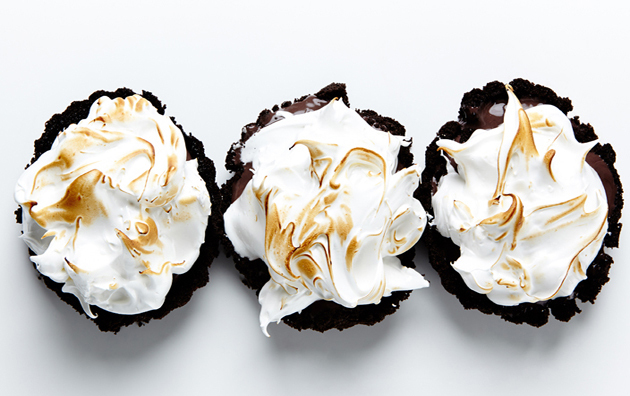 There’s nothing tiny about these amazingly Mini (4-inches each) Chocolate Pudding Pies – a chocolaty Oreo crust is topped with a smooth and creamy milk chocolate pudding and finished with an amazingly fluffy marshmallow-like meringue. Yes, this decadent dessert is every chocoholics kryptonite! 1) For the Oreo crust, preheat oven to 350ºF. Mix cookie crumbs and melted butter together in a medium bowl. Use your fingers to press the crust into the bottom of 12 (4-inch) tartlet pans. Bake 6-8 minutes. Remove from oven and let cool before filling. 2) For the milk chocolate pudding, in a medium saucepan, whisk together sugar, cocoa powder, cornstarch and salt. Place over medium heat and gradually whisk in milk and cream. Bring to a boil and cook while continuously stirring for about 2 minutes, until mixture thickens. Remove from heat and add milk chocolate and vanilla extract, stirring until smooth. Pour filling into cooled shells and refrigerate for 2 hours with surface of pudding covered with plastic wrap to prevent pudding skin. Just before serving, top with meringue. 3) For the meringue, place egg whites, sugar and cream of tartar in the bowl of an electric mixer. Constantly whisk egg white mixture over a saucepan with simmering water for 3-4 minutes. Transfer bowl to electric mixer and using the whisk attachment, gradually increase speed to high until stiff glossy peaks form. Fold in vanilla. Immediately spread over tarts and using a kitchen torch, lightly brown tops. For those of you who aren’t from the UK, yes, this perfect dessert recipe is “Banoffee Pie,” a slurring of the words banana and toffee. As classically British as 007 and a stiff upper lip, banoffee is a sticky, seductive pie of creamy toffee and slices of sweet banana. Lisa, a longtime Spice Girls fan, wanted to do a little oomph to this already decadent dessert, so she crowned it with a crunchy top layer of graham crackers coated in milk chocolate and toffee bits. 2) For the crust, in a small bowl, combine graham crumbs, melted butter and sugar. Press mixture into the bottom and up the sides of pie plate. Bake 10 minutes. Set aside to cool. Leave oven on at 350°F to bake chocolate graham topping. 3) For the filling, remove labels from cans of condensed milk. Place cans in a medium saucepan and submerge the unopened cans in water. Place saucepan over medium heat and bring water to a boil. Partially cover and boil 2½ hours, making sure to keep cans covered by water the entire time, adding more water as it evaporates. When done, remove cans from pot and cool 30 minutes before opening. 4) For the topping, line a baking sheet with aluminum foil and coat with non-stick cooking spray. Arrange graham crackers in a single layer, edges touching. In a medium saucepan, melt butter over medium heat. Add sugar and brown sugar, stirring to combine. Once mixture comes to a boil, turn heat to low, stop stirring and let gently bubble for 2-3 minutes. Remove from heat and immediately pour over graham crackers. Bake 8 minutes. Remove from over and sprinkle with chocolate chips. As they start to melt, gently spread over graham crackers and sprinkle evenly with toffee bits. Once cooled to room temperature, refrigerate 1-2 hours, until firm enough to break into 1-to 2-inch irregular shaped pieces. 5) To assemble pie, pour cooked condensed milk over prepared crust, spreading evenly. Allow to cool completely. Slice bananas over the filling. 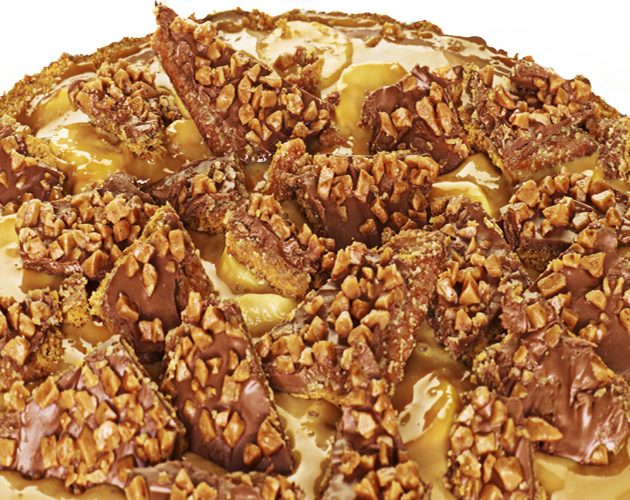 Top with chocolate toffee graham cracker pieces. Refrigerate. Serve chilled. On July 1, 2006, all eyes were on the State of Florida. New fashion in thongs? Winter weather? Lost ballots? None of the above. A tight race was dominating headlines – what would become the official state pie? After a real nail-biter, Key Lime beat out Pecan. Some attribute the victory to a fancy PR campaign, but when you’re after some cool in the swelter of the Sunshine State no dessert can beat the tart and creamy custard and fluffy meringue cover. 2) For the crust, in a medium bowl, mix together graham cracker crumbs, sugar and melted butter. Press the mixture onto the bottom and sides of the prepared pie plate. Bake the crust for 8 minutes. Set aside and lower the oven temperature to 300°F. 3) For the filling, in an electric mixer, use the whisk attachment and beat the egg yolks on medium speed until fluffy, about 3 minutes. Gradually add the condensed milk and beat mixture for 4 minutes more. Add lime juice and zest and beat just until combined, about 1 minute. Pour the mixture into the prepared crust. 4) For the meringue, in a clean and dry bowl of your electric mixer, use the whisk attachment and beat the egg whites and table salt until stiff. Gradually beat in sugar and continue to beat until stiff peaks form. 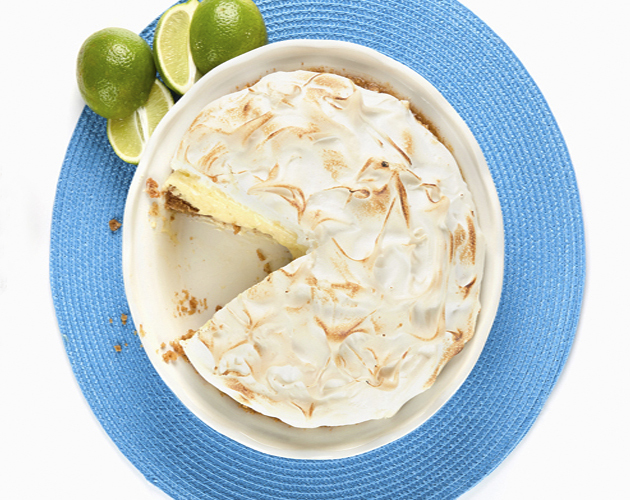 Spread meringue over the key lime filling and bake for 25 minutes until nicely browned. Remove from oven and let cool completely. Place in refrigerator at least 1 hour prior to serving. How do you improve on a classic? Put Chef Lisa on the job. She has expertly created a Chocolate Peanut Butter Pie (think: giant Reese’s Peanut Butter Cup), layers of chocolate pie crust, creamy peanut butter filling and rich chocolate fudge, and kicked it up a notch with the addition of addictive and easy homemade peanut brittle. 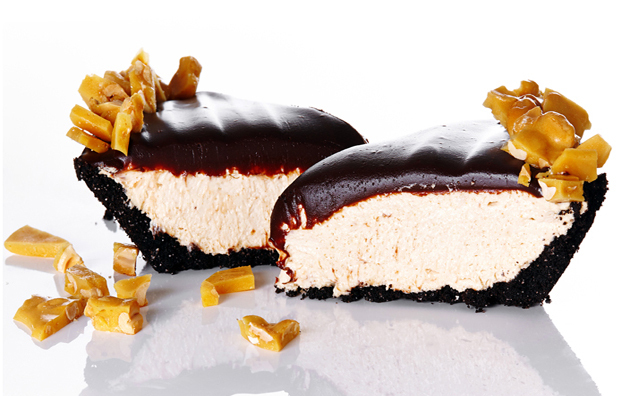 This smooth-centered, crunchy-topped Peanut Butter Pie is the perfect pie! 1) For the peanut brittle, cover a baking sheet with parchment paper. In a large saucepan, combine sugar, corn syrup, salt and water over medium heat. Bring to a boil, stirring until sugar is dissolved. Using a candy thermometer, continue cooking, stirring frequently until the temperature reaches 250ºF. Add peanuts and continue cooking until mixture reaches 310ºF. Remove from heat and immediately stir in butter and baking soda. Pour onto prepared baking sheet and spread with a spatula as quickly as possible, before mixture begins to harden. Set aside and let brittle set before cracking into pieces. Once hardened, peanut brittle can be broken up and stored in an airtight container for up to 1 week. 2) For the piecrust, preheat oven to 350ºF. Using a food processor, pulse Oreo crumbs, butter and sugar until well combined. Pat mixture into a 9-inch pie plate and press it along the bottom and up the sides. Bake 12-14 minutes and cool completely before filling. 3) For the peanut butter filling, using an electric mixer, on medium speed combine cream cheese, peanut butter and icing sugar until light and fluffy. Add vanilla and milk, mixing until well combined. Fold in whipped topping and spoon into cooled piecrust. 4) For the chocolate topping, in a small saucepan, bring cream and corn syrup to a boil, stirring occasionally. Remove from heat and stir in chopped chocolate, mixing until melted. Let cool slightly before topping pie. Cover the top of the pie with chocolate topping and chill uncovered for at least 1 hour until firm. Garnish with pieces of peanut brittle. Love pie? This is the one for you, this perfect Lemon Meringue Pie, courtesy of our Mom. 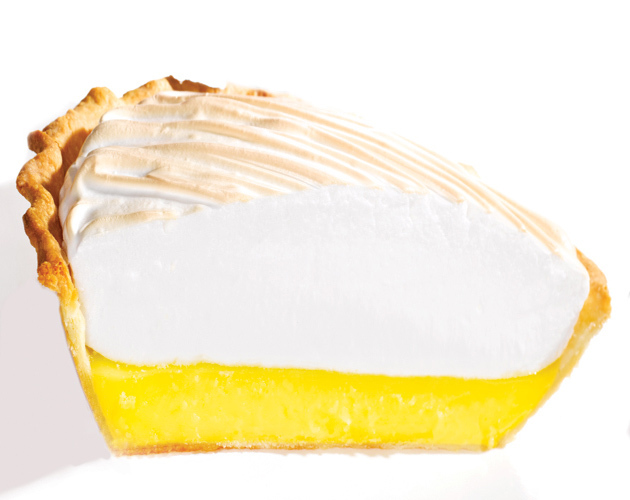 It starts with a crust that’s the ideal combination of flaky and butter, is topped with a smooth, tart and luscious lemon filling and is finished with airy, fluffy and mile-high meringue. 1) For the crust, place flour, salt and cold butter in food processor bowl. Process for 2 seconds at a time, 4 times, until mixture resembles coarse crumbs. In a small measuring cup, combine ginger ale and lemon juice. Add to machine while it is running. Process until dough gathers in a ball, about 10 seconds. Remove dough and press into a circular disk, about 1-inch thick. Wrap in plastic wrap and refrigerate at least 1 hour or overnight. 2) Preheat oven to 400°F. 3) On a lightly floured surface, roll dough into a 12-inch circle. Fold the circle in half and transfer it to a 9-inch pie plate. Trim off overhanging edges leaving about 1-inch excess. Fold under the excess dough and decoratively flute the edges. Line the pie crust with aluminum foil, waxed paper or parchment paper, then fill with pie weights or dried beans. Bake 14 minutes. Gently remove weights and foil, waxed paper or parchment from crust. Prick the bottom of the pastry all over with a fork. Continue to bake 12 minutes more or until evenly golden. Cool for 10 minutes before adding lemon filling. 4) For the lemon filling, place the egg yolks in a small bowl, whisk to combine and set aside. In a medium saucepan, combine sugar, cornstarch and salt. Stir in water and lemon juice until smooth. Bring to a boil over medium heat and stir continuously 1-2 minutes or until thickened. Remove saucepan from heat and add a small amount of the hot sugar mixture to the egg yolks. Stirring constantly, add the egg yolk mixture to the saucepan. Bring to a gentle boil over medium heat and stir for 2 minutes. Remove pan from heat and add lemon zest and butter. Allow filling to cool slightly and set aside. 5) For the meringue, in a mixing bowl, beat egg whites and cream of tartar on medium speed until foamy. Increase the speed to high and gradually beat in sugar until stiff, glossy peaks form. 6) To assemble, lower oven temperature to 375°F. Spoon the lemon filling into the baked pastry shell. Pile the meringue on top of the lemon filling making sure it touches the crust all around, otherwise the meringue will shrink away from the sides when it is baked. Using the back of a spoon you can create swirls and peak designs with the meringue. 7) Bake 10-12 minutes, until the top is lightly golden. Remove from oven and let cool for at least 1 hour at room temperature before serving. 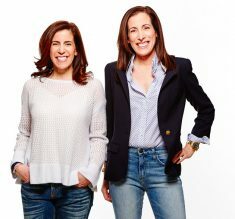 Authors of bestselling cookbooks Bite Me, Bite Me Too and Lick Your Plate, saucy sisters Julie Albert and Lisa Gnat love eating, feeding, entertaining and dishing up easy recipes at BiteMeMore.com.